Jo-Wilfried Tsonga is one of the leading French players on the tour and achieved a career-best world ranking of number 5 in February 2012. His best performance in a Grand Slam came at the 2008 Australian Open when he stunned Rafael Nadal in the semi-final before losing to Novak Djokovic in the final. He then won his first ATP Masters Series championship in Paris. He also made the semi-final of the 2010 Australian Open and at Wimbledon in both 2011 and 2012. 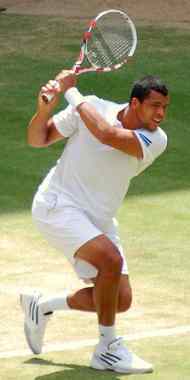 Tsonga reached the semi-finals of all four junior Grand Slam events and won the US Open Juniors title in 2003 with victory over Marcos Baghdatis in the final. He turned professional in 2004 but a series of injuries meant that it was three years before he could participate fully on the tour. He made his first real impact on the tour when playing as a wild card entry in the 2007 Australian Open. He took part in the longest tiebreak in the tournament’s history, eventually winning 20-18 against Andy Roddick. Although beaten in four sets, he had shown that he could compete with the best. He went on to win four Challenger titles in Tallahassee, Mexico City, Lanzarote and Surbiton. At the 2007 Queen's Club Championships he beat the defending champion and former World No. 1 Lleyton Hewitt in straight sets. He gained a wild card entry for Wimbledon and reached the fourth round before losing to his compatriot Richard Gasquet. At the US Open, Tsonga beat Tim Henman in the British player’s last Grand Slam before losing to Nadal. Tsonga reached the top 50 in the world rankings for the first time in his career. Tsonga beat Andy Murray in the first round of the 2008 Australian Open and reached the semi-finals for the first time. Tsonga then played one of the best matches of his career to stun Nadal with a straight set victory. Despite being the first player to take a set from Djokovic in the event, he lost the final in four sets. A knee injury interrupted his season before reaching the third round of the US Open. He won his first career ATP title in the Thailand Open, gaining his revenge on Djokovic. He then won at the Paris Masters, beating David Nalbandian in the final. He reached the quarter-finals of The 2009 Australian Open before losing to Spaniard Fernando Verdasco in four sets. His first title of the year came at the South African Tennis Open in Johannesburg and followed up in the Open 13 in Marseille. He won his third title of the year in the Japan Open in Tokyo, beating Mikhail Youzhny and ended 2009 in the top ten for the second consecutive season. Tsonga made another good showing at the 2010 Australian Open, beating Djokovic in a five-set quarter-final before losing to Federer. Injury forced him to retire in the fourth round of the French Open and he was beaten by Andy Murray in the quarter-finals at Wimbledon. A bad knee injury put him out of action until October and he ended a frustrating year outside the top ten with a 31-16 win-loss record. He gradually found his form in 2011, reaching his first final at the ABN AMRO World Tennis Tournament in Rotterdam before losing to Robin Söderling. An ankle injury halted his progress and he later announced that he had split from his long-time coach Eric Winogradskty. He returned to make the third round of the French Open and hit form at the AEGON Championships in London. He defeated Michael Berrer, Rafael Nadal and James Ward before losing to Andy Murray in the final. At the 2011 Wimbledon Championships he pulled off a major shock when fighting back from two sets down to beat Roger Federer, the first time that the Swiss player had ever been defeated from two sets up in a Grand Slam. Tsonga was beaten by Djokovic in four sets in the semi-final. Tsonga finally ended his tournament drought with victory in the 2011 Open de Moselle and followed up with a semi-final placing at the China Open. He then won the Erste Bank Open with victory over Juan Martin Del Potro in the final. His excellent run of form continued when reaching the final in the BNP Paribas Masters before losing to Roger Federer. Tsonga qualified for the ATP World Tour Finals but again found Federer too good. He still finished the year by equalling his previous best world ranking of six. Tsonga started 2012 with victory in Qatar and he reached the quarter-finals of the French Open before losing in five sets to Djokovic. His best Grand Slam performance of 2012 was at Wimbledon, beating Lleyton Hewitt, Guillermo Garcia-Lopez, Lukáš Lacko, Mardy Fish and Philipp Kohlschreiber. He was eventually defeated by Andy Murray in four sets in the semi-final. He picked up his ninth career title at the Moselle Open, beating Andreas Seppi in the final. He finished the season strongly, losing to Djokovic in the final of the China Open and to Tomas Berdych in the final of the Shanghai Masters. Tsonga reached the quarter-finals of the Australian Open for the fourth time in his career in 2013 before losing to Federer.